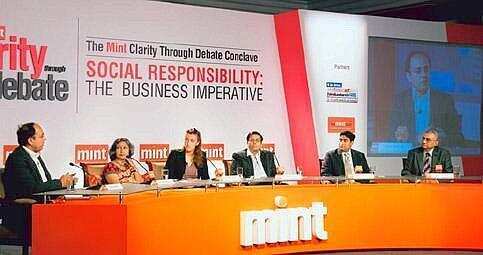 Business of giving:(from left) Jasjit Mangat, Pushpa Sundar, Cordelia Jenkins, Dhaval Udani, Deval Sanghavi and Vijay Chadda at Mint’s Clarity Through Debate Conclave on Social Responsibility: The Business Imperative. Photographs by Ramesh Pathania/Mint. What is the relationship between business and philanthropy in India today? Deval Sanghavi, chief executive officer (CEO), Dasra: Giving itself is actually quite difficult to do. Many people think that they can use one way of thinking when looking at businesses, but when it comes to philanthropy, they find the first organization that’s either close to them or that they’ve heard about and write a cheque in that manner. Jasjit Mangat, director, investments, Omidyar Network: There’s individual giving, the CSR (corporate social responsibility) aspect, and, at Omidyar Network, our model is perhaps the third leg of the stool, if you will, where we are investing the legacy capital of a very successful businessman, Pierre Omidyar, who co-founded eBay. The intent here is that you don’t just support isolated organizations, but you look to create an ecosystem effect, where you have a combination of both for profit-making organizations as well as not-for-profit enablers, platform enablers, government policy, regulations, etc., that make it conducive for a whole area to grow. We have multiple examples of that in our country. Affordable medical technology is one example; we import most of our medical technology into our country today. The bulk of our population lives at less than $4 a day and there just isn’t enough prevention. But at the same time, we don’t have medical device regulation in the country, certification, we indeed don’t have the ecosystem in which you’d have either the individual companies flourishing or the conditions for those companies to flourish. That’s where we look to step in and invest both in for-profit organizations as well as in not-for-profit grant-making that, in a sense, improves the ecosystem externalities in which these companies can grow. What’s changing with the way CSR works in India now? From merchant charity, we progressed after industrialization to philanthropy, and then as corporations became the prevalent norm, we went on to corporate philanthropy and, today, we have what is called CSR. Now, CSR is larger than philanthropy; it’s not about just giving. Earlier, philanthropy was giving out of your net profit, counted after you have paid tax and so forth, and then whatever the surplus was there, you did philanthropy out of it. Today, what CSR implies is that you factor in the cost of doing philanthropy, good works, engaging with the community, and then whatever is left you call that “responsible profit". So the model has changed and it’s a much wider concept than before. Today, we talk about the triple bottom line, which is making benefits to your shareholders, benefits to the environment (or at least not harming it), and then of course for society. So there has been a progressive change in concept as well as practice in India and, of course, some of it has been influenced by the West, but it’s not that we ourselves have had a very long tradition of giving and responsible behaviour. At times there have been lows and at times there have been highs. But now, I think philanthropy is taking shape where you are actually picking up social causes that are dear to your heart and saying that you will, as a corporate fund or a trust, work in that area to create a meaningful and sustainable impact. It’s getting more and more organized. Even charity and philanthropy are getting corporatized to that extent in terms of systems and processes. What is the extent of the government role in philanthropic models? Chadda: Philanthropy has to be directed in areas which will get the government to wake up. For example, in education, we can never replicate the government. There are millions of government schools; the purpose is to make the government sector work. If the government schooling doesn’t work, we are doomed. You have to create a model which will make people sit up and take notice, make them aware; they’ll start demanding quality from the government in services that it is supposed to deliver. No philanthropist can replace the government, but most philanthropists work in areas where the government is supposed to do work but is failing miserably. Dhaval Udani, CEO, GiveIndia: However much an individual, a corporate, or a foundation can do in India, the government is probably spending 10,000 times more—I don’t know what the impact is. Even at the HNI (high net-worth individual) level, if a person actually gives, he starts experiencing change within himself and it percolates down to what he does within his company. And that makes a difference to how the company behaves. We (GiveIndia) are a marketplace, and just as you have a stock exchange which decides what the right price is for each company, we believe that with sufficient information. That each NGO (non-governmental organization) should provide, a donor will decide which is an effective organization, which is efficient. A marketplace of a million donors can decide better than any group of experts, but we have some way to go to make that happen, which is why we require NGOs to disclose more of what they do. How much impact did the recent visit by Bill and Melinda Gates and Warren Buffett have on Indian philanthropists? Sanghavi: The visit created quite a bit of buzz, the media has really taken on philanthropy as a topic for discussion, and people are looking at not just giving to charity per se, but being more strategic about their giving. I think what we can learn from Bill Gates and the Warren Buffett is not just the quantum of funds that they give, but more importantly, their successes and challenges in giving their money away, and I think that is a dialogue which still hasn’t taken place to a large extent in this country. I think those discussions where philanthropists are having honest conversations about what has worked and, more importantly, what has not worked, I think, is fantastic and that brings philanthropy onto an intellectual level where we can all discuss what’s the greatest way to create impact, as opposed to what is the greatest way to get our names out.